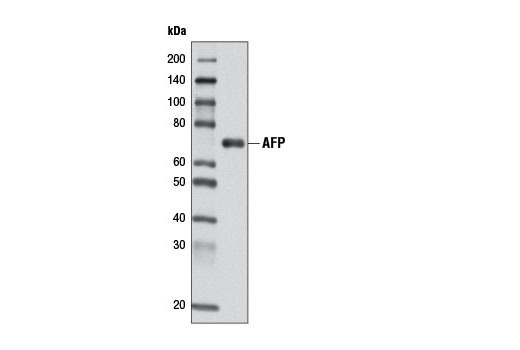 Western blot analysis of extracts from Hep G2 cells using AFP (D12C1) Rabbit mAb. AFP (D12C1) Rabbit mAb recognizes endogenous levels of total AFP protein. Monoclonal antibody is produced by immunizing animals with a synthetic peptide corresponding to residues near the carboxy terminus of human AFP protein. Alpha-fetoprotein (AFP) is a 65 kDa glycoprotein found in the mammalian fetal liver, yolk sac, and GI tract. While AFP expression in adult cells is low, it is aberrantly expressed in adult liver cancer cells (1,2). The tumor suppressor gene p53 and β-catenin are both involved in the regulation of AFP expression. In normal adult cells, p53 binds to the repressor region of the AFP gene, thereby blocking transcription. Mutations in both p53 and β-catenin are associated with aberrant expression of AFP. Research studies have shown that elevated serum AFP levels are predictive of hepatocellular carcinoma (3). Meier, V. et al. (2006) Comp Hepatol 5, 2. Warnes, T.W. and Smith, A. (1987) Baillieres Clin Gastroenterol 1, 63-89. Peng, S.Y. et al. (2004) Int J Cancer 112, 44-50.